California Dial, DLC-Coated Titanium case, Cuff Strap, 8-day hand-wound movement... And Reasonable Price! 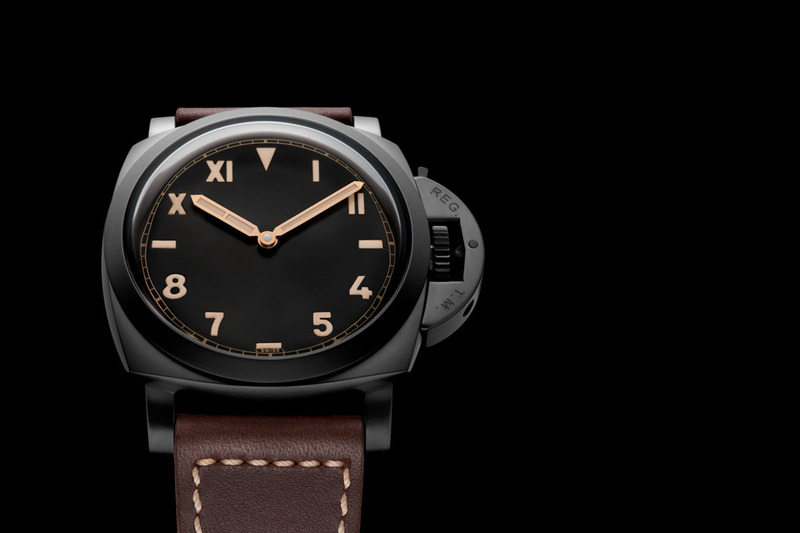 Let’s get straight to the point: the new Panerai Luminor California 8 Days DLC 44mm PAM00779 is packing all the possible cool things Panerai can do in a single watch to an almost gimmick-like level… But honestly, it simply works! It has a strong, distinctive and masculine look, which results in a completely original combination of classic Panerai elements. This PAM00779 is, to us here at MONOCHROME, one the most interesting new watches the brand has recently launched – and even its price is rather competitive. Overview. 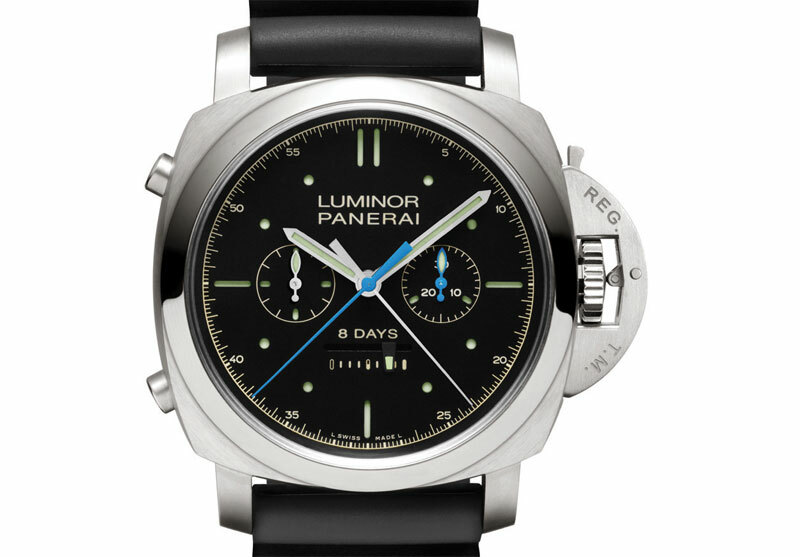 For its latest release, Panerai is somehow going for the easy recipe. 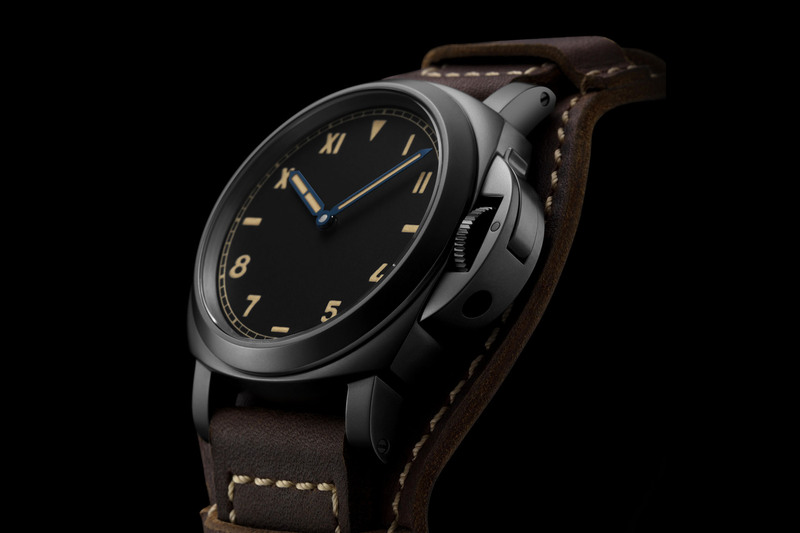 The new Panerai Luminor California 8 Days DLC 44mm PAM00779 is indeed a concentrate of all things iconic at Panerai: 44mm Luminor case, bridge lever device over the crown, DLC-coated titanium case, California dial with a time-only display, blued hands, 8-day power reserve movement… And they even add a cool new Bund-like cuff strap. It could have been a total mess, it could have been a proper gimmick but in the end, the new PAM00779 is clearly very pleasant. The base for this PAM00779 is the utilitarian-looking Luminor case, measuring here 44mm (the intermediate, almost wearable case size at Panerai) and crafted in titanium to be lightweight and resistant. To give the watch a more modern, less precious feel, the case is coated with DLC (Diamond-Like Carbon), an even carbon-based layer which gives the metal a uniform appearance, with a matt anthracite finish and greater hardness, resistant to scratches and corrosion. As part of the Luminor family, the California 8 Days DLC 44mm PAM00779 features the iconic bridge lever device that protects the winding crown. This part is also coated with DLC and contributes to the 300m water resistance of this watch. 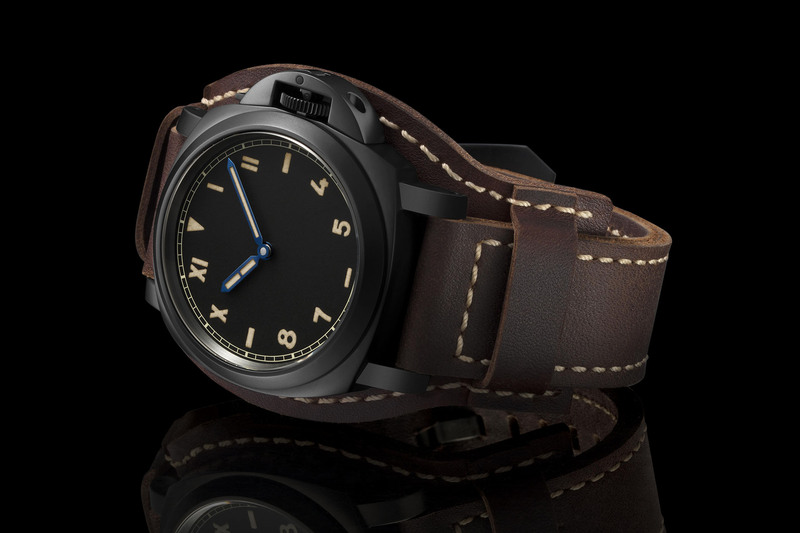 Moving to the strap, Panerai brings something new that won’t help the watch to feel smaller on the wrist but that actually befits the military inspiration rather well: a so-called “Bund” strap. 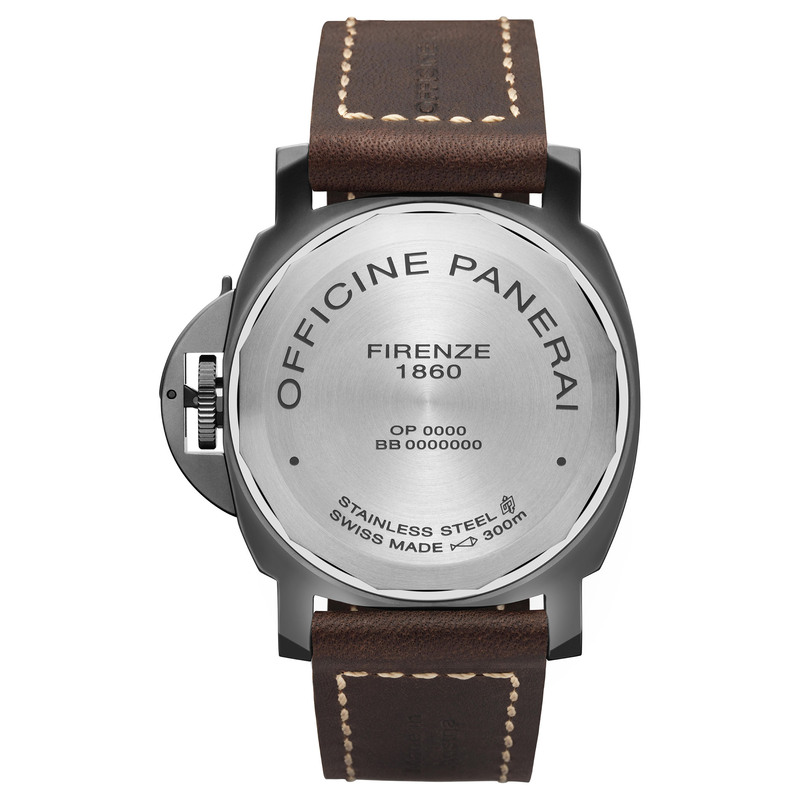 While the watch can be worn classically with its 2-part strap, made in untreated brown leather with beige stitching (a classic for Panerai), you can also use the additional cuff accessory supplied – something originally designed for military use, which prevents the back of the watch coming into contact with the skin. A black rubber strap is also included in the box. 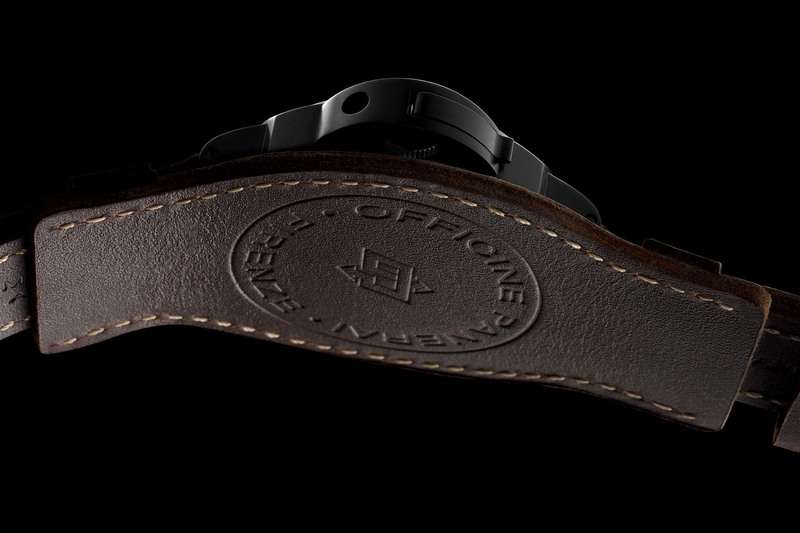 The dial of the PAM00779 is also very traditional for Panerai, as based on the iconic “California” design. These dials, originally used by Panerai on some of its earliest military creations, combine baton hour markers with Roman and Arabic numerals. 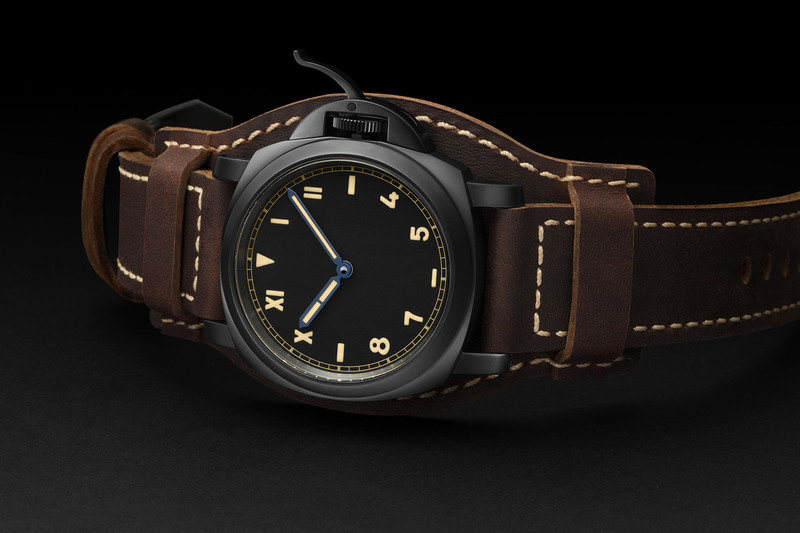 All of them are painted in tritium-coloured SuperLuminova, to enhance the vintage/military look of this watch. 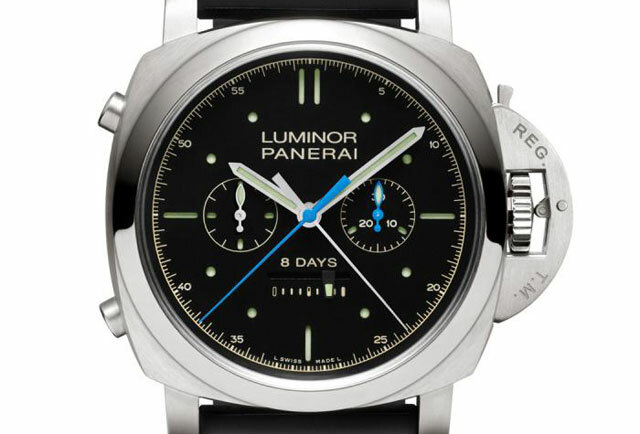 The PAM00779 is a simple 2-hander (hours and minutes), as often for California-dialled watches – see for instance the PAM00629 – and the two hands are thermally blued. Inside the titanium case of the PAM00779 is an 8-day power reserve movement, the in-house calibre P.5000. Again, this choice is relevant to the military past of the brand, when watches delivered to Italian frogmen were equipped with large Angelus 8-day movements. The calibre P.5000 is a modern engine, with 2 mainspring barrels in series and a reliable (rather simple) conception. The movement isn’t visible as concealed underneath a plain caseback. 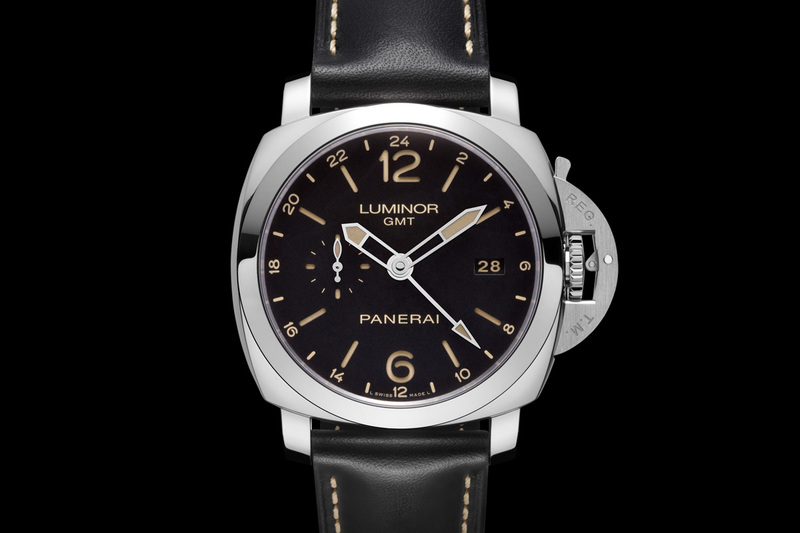 Last but not least, the Panerai Luminor California 8 Days DLC 44mm PAM00779 is not only a very cool-looking watch with many iconic features, but it also a well-positioned piece, as priced at EUR 7,900 – consider that the 2015 Panerai Luminor 1950 3 Days Titanio DLC ref. PAM00629 (also with California dial, also with a titanium DLC-coated case, in 47mm but with the 3-day Calibre P.3000 hand-wound) was priced at EUR 11,400… Really, this new PAM00779 has some arguments! 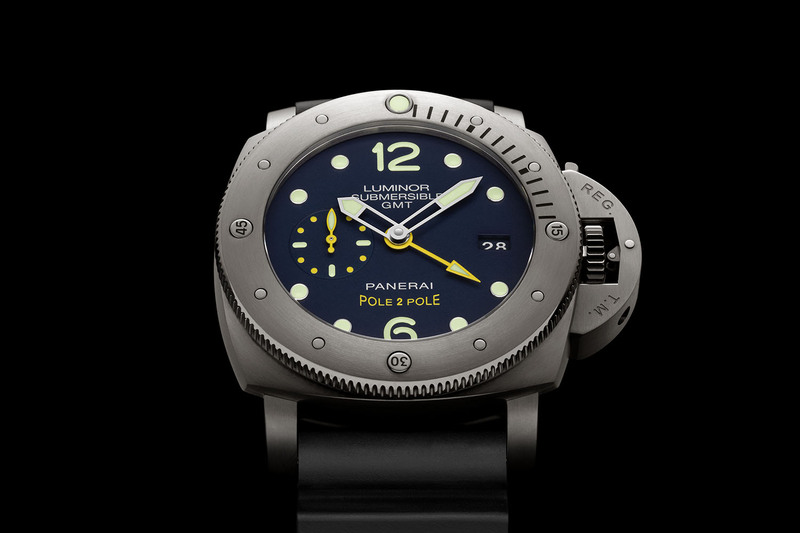 More details on Panerai.com. 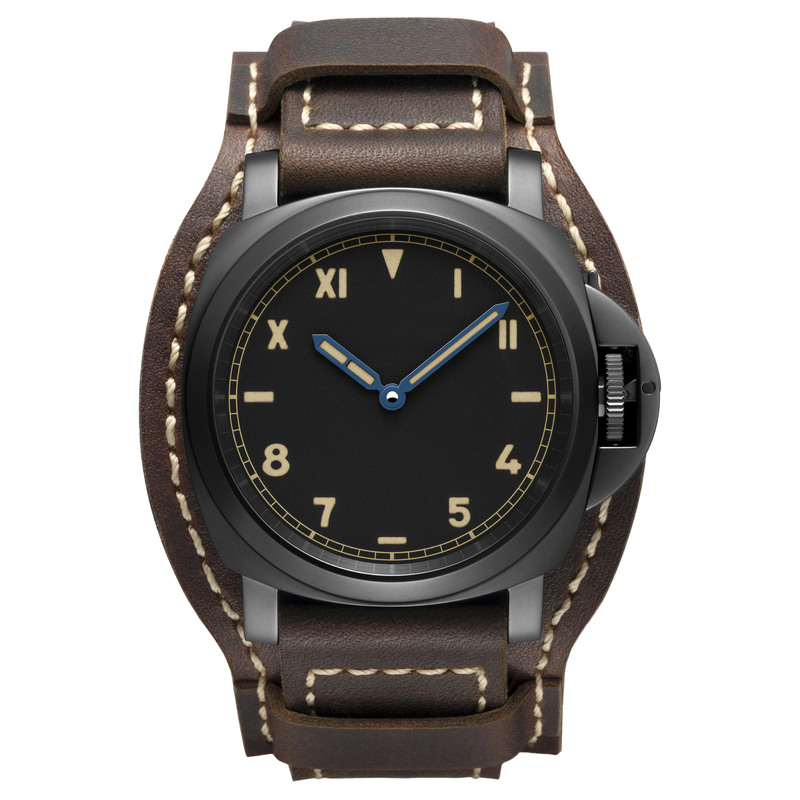 Panerai just about had any possible historic and contemporary dial variation combined in any possible case, sometimes without any reference and historical appreciation of the brand. California dial should NEVER be housed in the Luminor Marina case – never! This model is now nothing more or less than a custom modded no-name watch. Interesting , when I saw the price I thought maybe they had stuck it in the cost cutting 100M case , but no , its 300m , maybe with Bonati gone they are trying to attract people back into the fold with realistic prices . The brand is indeed trying to move prices down. For instance, they also introduced recently a new Radiomir Base 3 Days Acciaio (PAM00753), with in-house movement, and priced at EUR 3,900. Going back to slightly more basic watches, still with cool look. I missed the 753 , very interesting , in house movement , I’d rather have this that the new 0000 with the 100M case . But is it really such a good value? Case is just DLC coated, not ceramic. P.5000 is a simple caliber, not a looker and not terribly difficult to finish. As far as I know, the accuracy is also mediocre. So, 8k seems still inflated. Almost a home run but for the missing running seconds subdial. Need to see movement and there is a great amount of blank canvas if you will crying out for a tiny dial. Otherwise a sterile dial works especially with an iconic recognizable design. Great one for those who have nothing to prove – eg the stoic capitalist. Reminder – “8 Days” are not exactly entry level options. Not being stoic and at best a resistant capitalist, I honestly don’t understand the loyalty this brand generates. I do love the color combination with the hands in particular working well for me. The strap for me is a semi-successful gimmick that doesn’t scratch my aging hippy itch.